A sports psychologist in Saltburn is looking for people who want to use his research skills to become super surfers. Saltburn has attracted surfers since 1963 when John Smith brought the sport to the Victorian town. 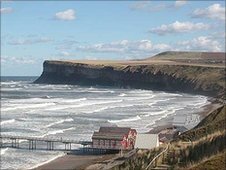 Due to sea conditions, many beginners come to Saltburn, as well as more experienced surfers. Craig Watson wants to meet people who have reached a plateau and help them as part of his masters research. He is based in the town and spoke to BBC Tees’ Steve Mackey about the project: “I’m looking for five people who already surf, who may be struggling getting to the next level and need help with removing a mental block. Gary Rogers who runs a surf shop on the beach at Saltburn thinks the idea sounds good. He said: “A lot of surfers do reach a mental block and can’t go any further despite how physically able you are.